anonymous inner classes are coded inline. listeners are defined as interfaces, e.g. // Here is a class that implements the ActionListener interface. // There is only one noticication method. // Add our custom action listener to the button. // Add our custom item listener to the choice. // (by extending the KeyAdapter class). // Add our custom key listener to the text field. // (by extending the WindowAdapter class). // the custom window listener methods are called. Create a class called ItemColorChanger which is an implementation of ItemListener that changes the color of a component based on what item was selected. 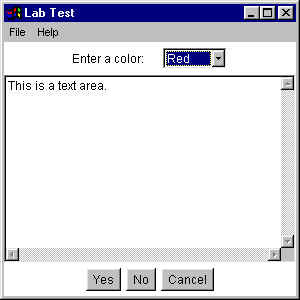 Add an ItemColorChanger as an item listener to the choice object, so that it changes the color of the text area. Create a class called ButtonTextChanger which is an implementation of ActionListener that sets the text of a text component to the button label whenever a button is clicked. Add a WindowListener to the frame that prints a goodbye message and exits when the window is closing. Use an anonymous inner class that extends WindowAdapter.